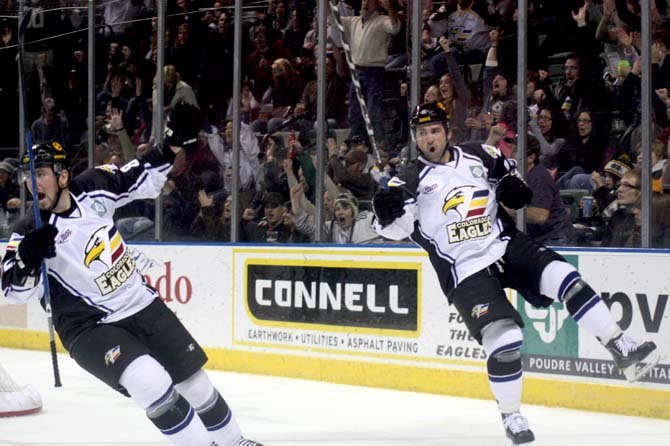 LOVELAND, Colo. – The Colorado Eagles defeated the Bossier-Shreveport Mudbugs, 6-1, earning a five-goal win against the team with the second-best record in the CHL one week after doing the same against the team with the best record (the Allen Americans). Andrew Penner backstopped the win, improving to 4-0-0 lifetime in the regular season against the ‘Bugs, while Steve Haddon continued his five-game point streak with a season-high four points (2-2-4) in the victory. Colorado controlled much of the first period — out-shooting Bossier-Shreveport 15-8 — and winning the special teams battle against the team with the top-ranked penalty kill and second-ranked power play in the league. The Eagles got into penalty trouble early, but were able to kill three penalties — including 1:36 of 5-on-3 play — in the first five minutes of the frame. The ‘Bugs got half of their total shots in the period during the early man-advantage span, as Colorado took control after that. Colorado got on the board first at 14:24 — taking advantage of their first power play — when Adam Hogg skated down the left wing, curled at the bottom of the circle and found Haddon for a one-timer from inside the circle. The Mudbugs tied the game at 1 with their own power-play goal just over a minute and a half later when David Rutherford sent a pass from the left dot to Jim Jorgensen at the right dot for a one-timer past Penner. The score came with a delayed call coming from referee Dan Dreger, putting the ‘Bugs on another immediate power play. But after Bossier-Shreveport was called for a penalty, putting the teams even at four players aside, Joe Grimaldi put the Eagles back on top at 17:33. Off the ensuing faceoff in the left circle of Colorado’s offensive zone, Haddon won the puck back to Grimaldi who gloved it out of the air and skated to the point before blasting a shot past Brian Foster. The Eagles continued their strong play in the second period, out-shooting Bossier-Shreveport 19-10 and out-scoring them 2-0 in the frame. At 6:55, Haddon found Kevin Ulanski with a pass from the left midboards and Ulanski skated to the slot before backhanding a shot past the ‘Bugs goalie. Penner continued his confident play at the other end of the ice, robbing Steven Crampton on a power-play chance midway through the second stanza, moving right to left and snaring his shot from low in the circle. And with just under two minutes to play in the period, Ulanski won a battle for the puck at the right point of Colorado’s offensive zone and found Daymen Rycroft for a sharp angle one-timer placed top-shelf from below the right circle. The Eagles took that 4-1 lead into the second intermission. The ‘Bugs out-shot Colorado 9-7 in the final frame but Penner stopped them all, and the Eagles’ power play notched two goals on a five minute major to stretch their lead to 6-1. Penner’s best save of the period came 4:30 in when he snared a shot from the low slot. And at 7:05 and 8:23, Riley Nelson and Haddon scored on the man-advantage with a snap-shot from the right circle and a bank-shot off the left post respectively. The Eagles will now break for the CHL’s 2011 All-Star Game in Rapid City where goaltender Kyle Jones will start in net for the All-Star team taking on the host Rush. Eagles Equipment Manager Tony Deynzer will also represent the team. Colorado will resume regular season action next weekend when the Odessa Jackalopes come to Loveland for a pair of games.